No More Logos On Videos For Product Placement: Recently, YouTube announced that it will prohibit the use of graphical title cards, including the use of sponsor logos and product branding, unless there is Google media buyout on the Partner content by the sponsor. It is a major setback for video creators who are generally sponsored by brands or other types of companies and in feature their logo prominently on the video, usually through a large image placed over top of the video. Limitation With Monetization Models: The new YouTube policy does not allow partners to burn advertiser-created and supplied pre-rolls into their content or other commercial breaks where YouTube offers a comparable ad format. Also, YouTube takes the default ad-based option for monetizing your video and the eCPMs are decided by YouTube, not you and that too regardless of the fact that your content may be more valuable than what they estimate. Also, popular revenue models like subscription (SVOD) and transactional (TVOD) are missing, thereby making ads the only model for monetization. In popular culture, the biggest video streaming services are either subscription based or transactional. i.e. Netflix, iTunes, Hulu etc. Weak Content Security: If you ever searched for a music video and did not find at least 10 users having uploaded it on their private channels with no fear of copyright infringement, we wouldn’t be writing this today. Scores of online video rippers can easily download YouTube videos in the blink of an eye and those videos are then redistributed causing tremendous losses to the original publishers. Hard To Gather Audience Data: YouTube’s half-baked analytics tool will not get you too far. Not knowing how your videos are performing on a variety of metrics like language, age, gender, demographics, location etc. can make your business strategy complacent due to the lack of proper analysis. The world of online video is growing and it has grown well beyond YouTube now. With literally every other cable network, broadcaster and telecom operator coming up with its own video streaming platform, there is a common ground for belief that there is more to be achieved in terms of video monetization and it will need more than what YouTube has to offer. If you’re more interested in monetizing your videos rather than having lots of people view them, you may want to consider one of the many enterprise level platforms for video monetization. These platforms are completely different from YouTube, but if you’re serious about licensing your video content, and have a pretty solid list of customers interested in doing it, this might be a good option for you. Typically such a platform will allow you to have personally branded page that hosts only your content that you can drive potential customers to so they can view and license your content. Down this road, one of the most budget friendly and feature-packed platforms you will come across is the Muvi platform by Muvi. This Platform-as-a-Service (PaaS) Video streaming solution from Muvi enables you to setup your on-demand and live video streaming platform in minutes for ‘Zero CapEx’ and start earning from Day 1 with your content. Not just that, it also enables you to deploy mobile, tablet, smart TV and OTT box apps in less than half a week along with the platform so that your video content is streamed across platforms and devices to cater to the need of every subscriber. Added to it is the ease of monetizing videos in hassle free steps. There are a variety of models to choose from: AVOD, TVOD, SVOD, Hybrids and a single click integration with any ad network and server. You get to choose your own ads, have your own branding and also your own HTML5 layers that you can use to syndicate your content everywhere on the web. 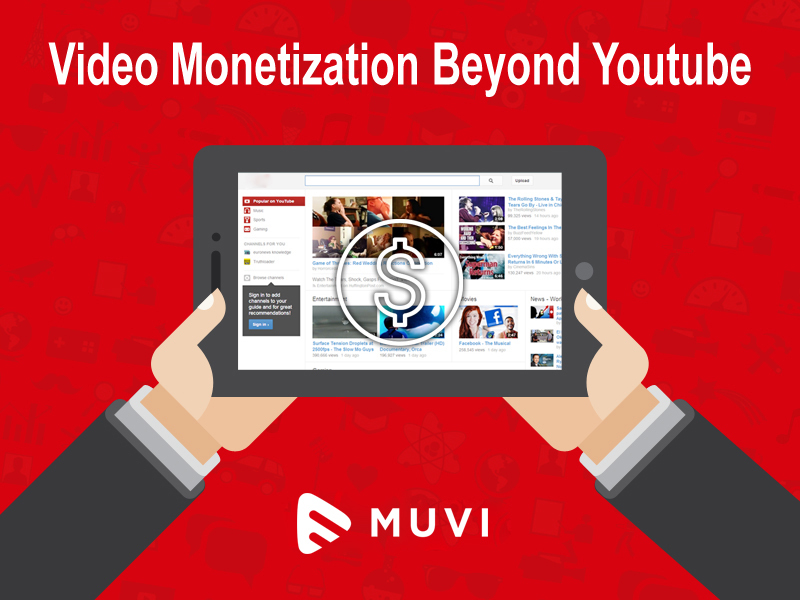 It’s time to look beyond YouTube to maximize the revenue potential of your video and the Muvi platform is a great way to start with.